An expression, also called an operation, is a technique of combination of a value and an operator, two values and an operator, etc. The value can be a known value or it can come from a field of a table. Based on this, to create an expression or to perform an operation, you need at least one value or field and a symbol. A value or field involved in an operation is called an operand. A symbol involved in an operation is called an operator. Neither Microsoft Access nor Microsoft Visual Basic is case-sensitive. Therefore, any word we are going to use that involves a field, its name, and new words we will introduce in this section, whether written in uppercase, lowercase or a mix, as long as it is the same word, represents the same thing. Based on this, the words TRUE, True and true, as related to Microsoft Access, represent the same word. A constant is a value that does not change. Examples of constants are algebraic numbers because they never change. Therefore, any number you can think of is a constant. Every letter of the alphabet is a constant. In the same way, any word you can think of is a constant. It can be the name of a control on a form or a report. The operand on the right side of the operator is referred to as the right value. It can be a constant, a value, an expression, the name of a field, or an object. There are various ways you can use the assignment operator. For example, in the Property Sheet for the control, in its Control Source, write an expression that assigns the existing field. In some other cases, the assignment operator will be part of a longer expression. An algebraic value is considered positive if it is greater than 0. A value is referred to as negative if it is less than 0. To express a negative value, it must be appended with the - symbol. Examples are -12, -448, -32706. Besides a numeric value, the value of a field or an object can also be expressed as being negative by typing a - sign to its left. For example, -txtLength means the value of the control named txtLength must be made negative. The property you are trying to use must be a valid property of the object. To name our objects so far, in some cases we used a name made of one word without space. Actually, you can use spaces or some special characters in a name. Unfortunately, when such names get involved in an expression, there would be an error or the result would be unpredictable. 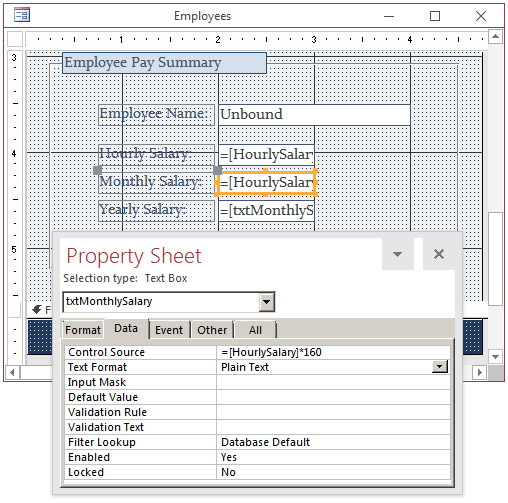 To make sure Microsoft Access can recognize any name in an expression, you can/should include it between an opening square bracket "[" and a closing square brackets "]". Examples are [© Year], [Soc. Sec. #], or [Date of Birth]. Even if the name is in one word, to be safe, you should (always) include it in square brackets. Examples are [Country], [FirstName], or [SocialSecurityNumber]. Therefore, the =txtLength expression can be written =[txtLength]. On the form, click one of the salary text boxes in the group box. To refer to a particular object in an expression, use the exclamation point operator "!". To do this, type the name of the collection followed by the ! operator, followed by the name of the object you want to access. For example, on a form, if you have a text box named txtLength and you want to refer to it, you can type [Controls]![txtLength]. Therefore, the =txtLength expression can be written =Controls!txtLength, and =[txtLength] can be written =Controls! [txtLength] or =[Controls]![txtLength]. The name of the collection is used to perform what is referred to as qualification: the name of the collection "qualifies" the object. In other words, it helps to locate the object by referring to its collection. This is useful in case two objects of different categories are being referred to. In a database, Microsoft Access allows two objects to have the same name, as long as they do not belong to the same category. For example, you cannot have two forms named Employees in the same database. In the same way, you cannot have two reports named Contracts in the same database. On the other hand, you can have a form named Employees and a report named Employees in the same database because each object belongs to a different collection. For this reason, when creating expressions, you should (strongly) qualify the object you are referring to, using its collection. An example would be Forms!Employees which means the Employees object of the Forms collection. If the name of the form is made of more than one word, or for convenience, you must use square brackets to delimit the name of the form. The form would be accessed with Forms![Employees]. These expressions would produce the same result. As you can see, results are different when parentheses are used on an operation that involves various operators. This concept is based on a theory called operator precedence. This theory manages which operation would execute before which one. A function is a task that must be performed to produce a result on a table, a form, or a report. It is like an operation or an expression with the first difference that someone else created it and you can just use it. For example, instead of the addition operator "+", to add two values, you could use a function. In Microsoft Access, you cannot create a function. You can only use those that have been created and exist already. These are referred to as built-in functions. Microsoft Access ships with various functions to perform different tasks. There are so many of them that we will review only a few. Once a function has been created, it can be used. Using a function is referred to as calling it. To call a simple function, you would just type its name. The person who creates a function also decides what kind of value the function can return. For example, if you create a function that performs a calculation, the function may return a number. If you create another function that combines a first name and a last name, you can make the function return text that represents a full name. Once a function has been created, it can be used in other parts of the database. Once again, using a function is referred to as calling it. If a function is taking one or more parameters, it is called differently than a function that does not take any parameter. We saw already how you could call a function that does not take any parameter and assign it to a field using its Control Source. 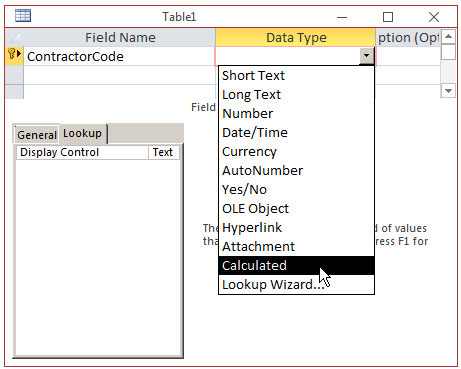 If a function is taking one parameter, when calling it, you must provide a value for the parameter, otherwise the function would not work (when you display the form or report, Microsoft Access would display an error). When you call a function that takes a parameter, the parameter is called an argument. Therefore, when calling the function, we would say that the function takes one argument. In the same way, a function with more than one parameter must be called with its number of arguments. The value passed as argument can be the name of an existing field. The rule to respect is that, when Microsoft Access is asked to perform the task(s) for the function, the argument must provide, or be ready to provide, a valid value. As done with the argument-less function, when calling this type of function, you can assign it to a field by using the assignment operator in its Control Source property. If the function is taking more than one argument, to call it, type the values for the arguments, in the exact order indicated, separated from each other by a comma. As for the other functions, the calling can be assigned to a field in its Control Source. All the arguments can be constant values, all of them can be the names of fields or objects, or some arguments can be passed as constants and others as names of fields. If a function that takes one argument has a default value for it, then you don't have to supply a value when calling that function. Such an argument is considered optional. Whenever in doubt, you should provide a value for the argument. That way, you would not only be on the safe side but also you would know with certainty what value the function had to deal with. If a function takes more than one argument, some argument(s) may have default values while some others don't. The arguments that have default values can be used and you don't have to supply them. 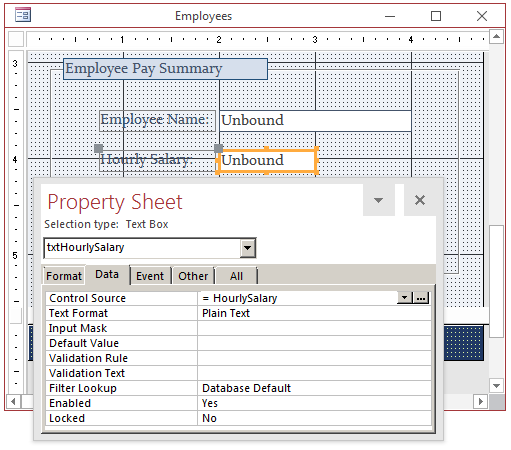 To assist you with writing an expression or calling a (built-in) function and reducing mistakes, Microsoft Access is equipped with a dialog box named the Expression Builder. The Expression Builder is used to create an expression or call a function that would be used as the Control Source of a field. The Expression Builder is resizable: you can enlarge, narrow, heighten, or shorten it, to a certain extent. Under the title bar, there is the Calculated Control link. If you click that link, a Help window would come up. Under the link, there is an example of an expression. The main area of the Expression Builder is a rectangular text box used to show the current expression. If you already know what you want, you can directly type an expression, a function, or a combination of those. To show the whole dialog box, click More >>. Under the text box, there are three boxes. The left list displays some categories of items. Some items in the left list appear with a + button. To access an object, expand its node collection by double-clicking its corresponding button or clicking its + button. After you have e xpanded a node, a list would appear. In some cases, such as the Forms node, another list of categories may appear. The top node is the name of the form or report on which you are working. To access a function, first expand the Functions node. 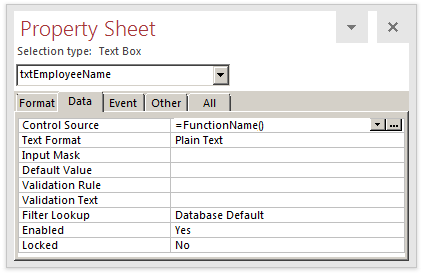 To use one of the Microsoft Access built-in functions, in the left list, click Built-In Functions. The middle list would display categories of functions. If you see the function you want to use, you can use it. If the right list is too long and you know the type of the function you are looking for, you can click its category in the middle list and locate it in the right list. Depending on the object that was clicked in the left list, the middle list can display the Windows controls that are part of, or are positioned on, the form or report. For example, if you click the name of a form in the left list,the middle list would display the names of all the controls on that form. To use one of the controls on the object, you can double-click the item in the middle list. When you do, the name of the control would appear in the expression area. To get help while using the Expression Builder, you can click Help. After creating an expression, if you are satisfied with it, to submit it, click OK. To abandon whatever you have done, click Cancel or press Esc. In both cases, the Expression Builder would come up. You can then type or create the desired expression in the top text box. 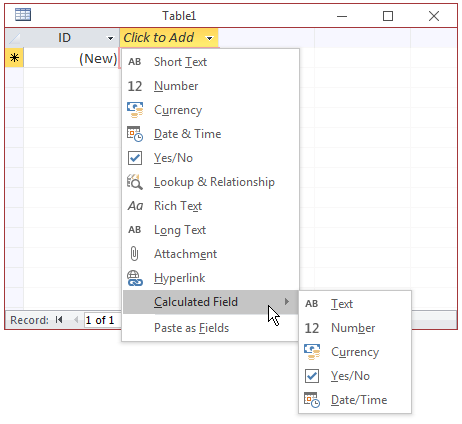 In order to create expressions that complete a database as we saw in previous lessons, you can use various functions available from Microsoft Access. These are referred to as built-in functions. Based on the table of ASCII characters, a call as Chr(65) would produce the letter A. Not all ASCII characters produce a known letter. For example, when Chr(10) is used in a string, it creates a "new line". The required argument passed to the InputBox() function is a message that would be displayed to the user. When the input box comes up, a form with a message and a text box would display to the user. When an input box comes up and you present a request, the user may not know what type of value you are expecting. To guide the user, you can provide a sample or default value. 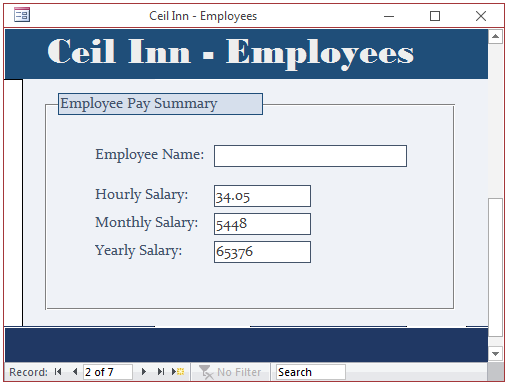 This value would display in the text box and it would be selected so the user can type to replace it. A message box is a Windows (operating system)-created form used to display some information to the user. As opposed to a regular form, the user cannot type anything on the box. There are usually two ways you can use a message box: you can simply display a message to, or request an answer from, the user. To create a message box, you have various options. This function takes only one required argument, the message to display. If you are creating the message box using a macr, type the message in the Message text box. If you are manually typing the code, pass it to the parentheses of the function. The message can be passed between double-quotes. The message to display can also come from another control on the form. For example, you can retrieve the value of a control and pass it as argument to the MsgBox() function. If you provide a value other than those in the list, the message box would display only the OK button. To specify this option, add the number to the second argument.